Fun Kids’ Top 10 Christmas Presents! Last week we gave away 5 copies of Arthur Christmas on DVD! The answer is an ultra-high-tech operation involving a lot of very impressive elves! But when they fail to deliver a present to one child, the unlikely hero Arthur sets out on an urgent mission to deliver that present before Christmas morning dawns! 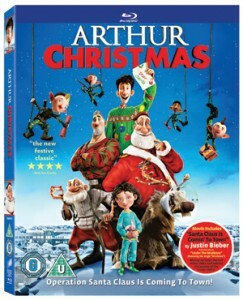 Arthur Christmas is finally out on Blu-ray and DVD so now, as well as watching the very funny film, you can enjoy loads of special features, including a music video of Justin Bieber performing ‘Santa Clause is Comin’ to Town’! Here’s a trailer of the DVD! To enter the competition you had to tell us what’s on your Christmas list. And we’ve put together the ultimate Top 10 Christmas Presents List from what you told us. These are Fun Kids top 10 Christmas Presents. Is there anything that you want that isn’t in this list? We’ll also be giving out loads of cool present ideas on Fun Kids. You can tune in on DAB Digital Radio in London and online across the UK! Click here to listen! I want an IPAD and a lego kit(Something to do with horses)PLEASE!!!!!!! !